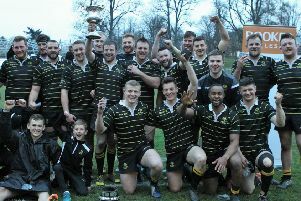 Greig Laidlaw (back row, right) with the Jed Jags. Young rugby players from Jed Jags were thrilled to receive a visit from a very special guest last weekend. Scotland captain – and Jedburgh lad – Greig Laidlaw (pictured on the right of the back row) visited the Jed Jags Mini Rugby training on Sunday and spent a full session helping the young players through their paces.